This section describes how you can track and report on printing that is sent directly from a computer to a printer, without the need for a print serverA print server is a system responsible for hosting print queues and sharing printer resources to desktops. Users submit print jobs to a print server rather then directly to the printer itself. A print server can be a dedicated server but on many networks this server also performs other tasks, such as file serving. This solution is ideal for businesses that have distributed branches with a modest number of computers, such as post offices, bank branches, gas stations, retail outlets. It also suits small businesses with a collection of computers in an environment without dedicated IT support. 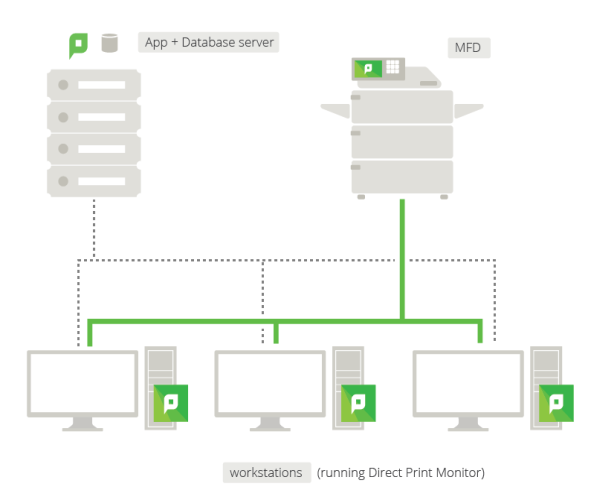 Direct Print allows you to monitor local printers without a print server. The combination of a Direct PrintingDirect Printing allows you to print directly from a desktop to a printer, without the need for a print server. configuration and a private cloud implementation of PaperCut can eliminate the need for any local infrastructure. Direct Printing is not recommended for environments using quotas or charging, such as education. This is because users can turn off PaperCut NG/MF's tracking from their computer. It might be possible, depending on permissions, for a user to disable the Direct Print MonitorThe Direct Print Monitor is the Direct Printing component that tracks jobs between desktops and an MFD., which would turn off print tracking on their computer. They have chosen to use a cloud-based Application Server. Since they do not have a dedicated print server and also do not have the experience to manage a print server, they want to print directly from their computers to the printer. 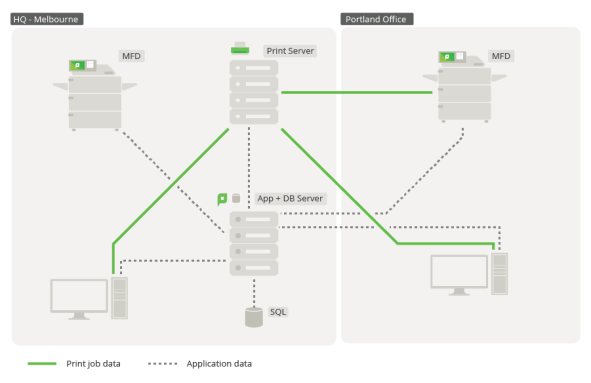 This PaperCut NG/MF solution is easy to set up and requires no IT infrastructure changes. Dash About Inc. is a medium sized taxi company that comprises a head office plus 20 home-based offices used by the drivers. They currently have PaperCut set up in their head office and now want to roll out PaperCut to each home office. They do not want the network overhead of print jobs being sent to head office and then back to the home offices via their VPN, but also do not want to set up a print server in each home office. Direct Printing is ideal in this situation as a print server is not required. Dash About have already set up an automated PaperCut install process for new computers and want to incorporate the Direct Printing installation into this process. Direct Printing allows print jobs to be sent directly from a user’s computer to a printer, without an intervening print server. This requires print queues (sometimes referred to as “printers” or “drivers”) to be set up on each computer for each printer. For example, on Windows, this is done through the Devices and Printers control panel. With this setup, there are multiple computers each with a print queueA print queue displays information about documents that are waiting to be printed, such as the printing status, document owner, and number of pages to print. You can use the print queue to view, pause, resume, restart, and cancel print jobs. directed at the same physical printer. However, you do not want each print queue to be displayed as a separate printer in PaperCut NG/MF. Direct Printing consolidates the print jobs from multiple print queues into a single printer. a print queue that sends jobs directly to a printer rather than to a print server queue. The print queue can use either the IP address or hostname of the printer. a small monitoring component, known as a Direct Print Monitor. This monitoring component reports back to the Application Server. Direct Printing simplifies the configuration, management, and reporting of print jobs. The Application Server automatically merges the information from multiple computers into one printer in the Printer List. This process is called linking. Each linked print queue automatically uses the printer's configuration, which means you do not need to configure each print queue individually. PaperCut NG/MF reports the summarized data at the printer level rather than for each individual print queue. The process of setting up Direct Printing, depends on the operating system.